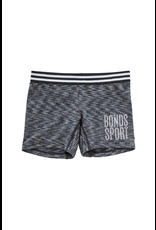 WHY YOU'LL LOVE THEM... With their longer leg and sporty design our Girls Micro Sport Shorties won't leave your girl short. • High performance moisture-wicking fabric • Cotton elastane gusset for extra support • Designed for all-day comfort under sports uniforms Product Code: UXQC1A Material: Polyester / Elastane. Country: Designed in Australia. Made in China.